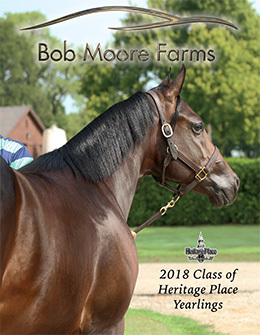 Bob Moore Farms just released e-magazine features photos and catalog pages of twenty-three Heritage Place yearlings Bob Moore Farms will represent during the September 20-22 sale in Oklahoma City. NORMAN, OK—AUGUST 29, 2018—Bob Moore Farms is pleased to announce the release of their quarterly e-magazine. The second e-magazine of the year features photos and catalog pages of twenty-three Heritage Place yearlings Bob Moore Farms will represent during the September 20-22 sale in Oklahoma City. "In today’s mobile inclined world, keeping advertising and marketing techniques fresh and engaging can be a challenge, Said director of equine operations Phillip Stewart, "Enhancing our advertising efforts to include social media, print and online outlets provides the best possible promotion for our consignors," "The online preview of yearlings gives potential buyers a sneak peek prior to the sale in an interactive way." CLICK HERE for the current issue of the Bob Moore Farms e-magazine. Bob Moore Farms has been a reliable name in the Quarter Horse racing industry for over 50 years. Specialized reproduction, stallion management, and sales preparation are among the list of services provided by the Norman, Oklahoma breeding facility. For more information on Bob Moore Farms, call 405-329-8571 or visit bobmoorefarms.com.